Naomi had a special tie with her only surviving grandparent, the painter Emma Hoffman, whom she called “Oma.” Oma showed her that making art can be a way to transmute grief, a way to bear the unbearable. 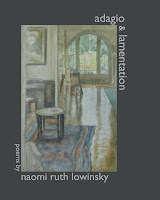 The cover of Adagio and Lamentation is a watercolor by Emma Hoffman—an interior view of the Berkeley home where Naomi visited her often as a teenager. Oma tried her best to make a painter of her, but Naomi was no good at it. Poetry was to be her vehicle. Adagio and Lamentation is Naomi’s offering to her ancestors, a handing back in gratitude and love. It is also her way of bringing them news of their legacy—the cycle of life has survived all they suffered—Naomi has been blessed by many grandchildren. Place your order for Adagio and Lamentation at Amazon.com or Barnes and Noble .